Fontana, Calif.- The City of Fontana and the Los Angeles Dodgers Foundation celebrated the groundbreaking of the Universally Accessible Dodgers Dreamfield #51 at Jack Bulik Park (16581 Filbert Ave.) during World Autism Awareness Day on Tuesday, April 2, 2019. 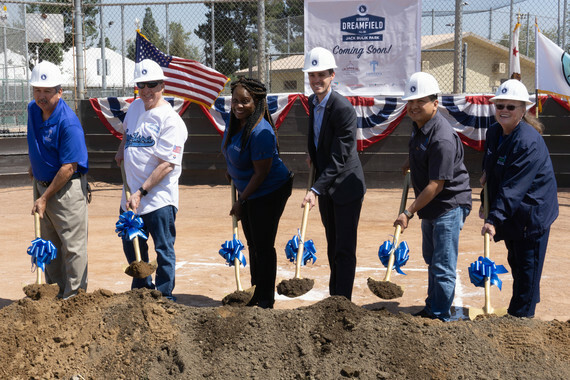 Attendees of the groundbreaking ceremony included Fontana Mayor Acquanetta Warren, Mayor Pro-Tem Jesse Armendarez and councilmembers Jesse Sandoval, John Roberts and Phillip Cothran, along with Fontana City Treasurer Janet Koehler-Brooks. Also in attendance was Los Angeles Dodgers Foundation (LADF) Chief Executive Officer Nichol Whiteman, actress and Co-Founder of HollyRod Foundation Holly Robinson-Peete and former LA Dodgers pitcher Dennis Powell. Contributing partners Cal Ripken, Sr. Foundation, Easterseals Southern California, San Manuel Band of Mission Indians, Security Benefit and LA84 Foundation also took part in the ceremony. Local children, including young athletes from the Little League Challengers Division, participated in the ceremonial shovel lifting, took pictures with officials and interacted with attendees. Dodgers Dreamfield #51 at Jack Bulik Park will include rubberized surfacing, enlarged dugouts with rooftops, backstops, player benches, bat racks, vinyl coated chain link fencing and gates, bleachers, LED solar scoreboard with signage that resembles Dodgers Stadium and concrete paving. For more information, please contact the Community Services Department at (909) 349-6900 or visit Recreation.Fontana.org.